I have finally left the house !! It is the first day since Christmas Eve!! All because of that intestinal flu! Got 3 cans for $1.39 each! Scented pine cones .... $1.00! Bright Pink Tinsel wreath ( will match in the guest Room)....75 cents! Tubes of Shatter Proof Balls !! 8 in a tube for........25 cents each!!!! I bought 10 tubes!! I plan on adding them to my garland outside and the wreaths that I hang on the windows next year!!! Another idea from all of you out there in Blogland who sung the praises of Shatter Proof Balls! Trims for crafts...... Check out the white fur one! Butterfly ornaments clips!! I am thinking for an Easter or Garden tree?????? And a silver tinsel tree for 2 bucks!! what can I tell ya???? Okay, I am HAPPY now!! 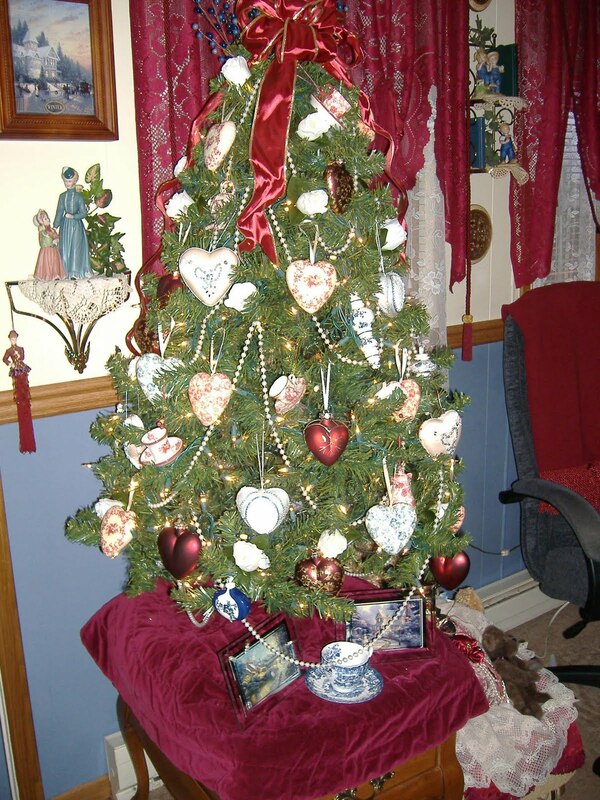 Don't take your tree down yet!! Unless you have a real one and then you have no choice! But now is the time to cruise the After Christmas Clearance sales to look for ornaments for different holidays and seasons!! And why should you take down the those trees when you can turn them into Valentine's Day trees????? Last year I left 5 of my trees up and converted them into Valentine's Day trees. 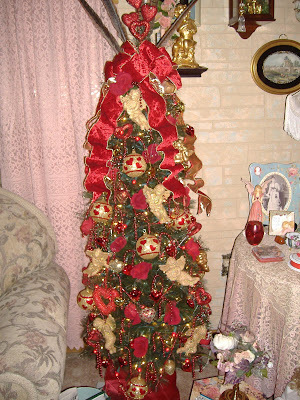 A 5 foot potted one in my Living Room..
You can leave up your garland outside too. Just add raffia bows, use only white lights, add snowflake ornaments to the garland and you are decorated for Winter!! Leave a sled and a snowman or too on the front porch and your house is a Winter Wonderland!! Why not brighten the dark of winter by keeping the lights twinkling both outside our homes and inside on a tree or two??? I am taking down the wreaths on my windows and putting up lighted snowflakes.... Winter Decorations!! Both Joe and I wish you all a very HAPPY and HEALTHY NEW YEAR!!!! Merry Christmas, belated that is! What did I get for Christmas this year.........a severe case of gastroenteritis! It hit me on Christmas day after I had already made dinner but right before I was to put it on the table for everyone! Joe handled it and everyone enjoyed it as I retreated upstairs to my bed and bathroom. First of all, have plenty of this, Gatorade, on hand. You need to replace your fluids and electrolytes so you do not get dehydrated or end up with an electrolyte imbalance which can lead to serious complications. I took medication to stop the vomiting because I needed to retain my Blood Pressure pills since my BP was sky high. I had a prescription medication but over the counter Dramamine will do. Tylenol for the fever is a good thing. mine was 102 degrees, plenty of blankets for the chills. The mistake I made after 2 straight days of relentless diarrhea was trying to stop it with an over the counter medication. I had to call my Dr. because since it lasted so long, I was actually afraid that something else was wrong and I had aggravated my already existing Back problem. DON'T TAKE ANYTHING TO STOP THE DIARRHEA!!! The medical mind set now is that the vomiting and diarrhea is excreting the virus from your system so if you stop it, you are only prolonging the virus in your system. Then follow a B.R.A.T. diet........ Bananas to replace your potassium, rice for bulk in your diet, applesauce and toast. Along with PLENTY of liquids to prevent dehydration. I missed all the after Christmas sales but Joe in his travels to one of our grocery stores found more of the Bearington Bears that I collect on sale for 75% off. A few more pics from around the house that I didn't show before. And I did find this at Ross's for only $2.99!!! 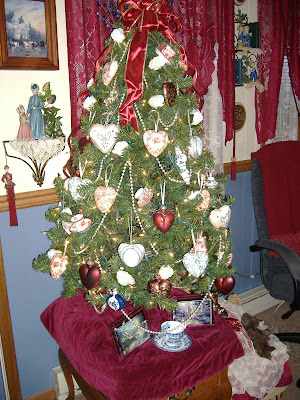 Well, pretty much the Holiday season of 2010 is just about over as will be my posts here at A Debbie-Dabble Christmas. I will be going back to posting on my regular blog, Debbie-Dabble. But I will post anything that has to do with Christmas here at A Debbie-Dabble Christmas through out the year. I would like to invite my followers here to please sign up to follow me over at Debbie-Dabble. 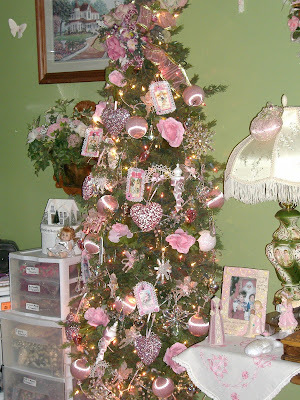 What a great holiday season it has been here in Blogland!! So many ideas, so many new friends, so many new crafts!! Who would have thought of creating their own flocked trees by spraying them with Fake snow. Who would have thought of using silver spray paint to change a green wreath into a silver one. And all of the other fantastic ideas that all of you shared....... mind boggling!!! I am still visiting the homes on all the house tour parties and I suspect I will be for quite awhile as there were so many. I want to thank you all for enriching my life this Holiday season. Blogging is better than any decorating or recipe magazines or books !!!! I hope to see you over at Debbie-Dabble!! Wishing you all a Happy and Healthy New Year!!! About 4 pm on Christmas Day, I got hit with a tons of bricks called the dreaded Intestinal Flu. Luckily, I had finished dinner but Joe had to put it out on the table as I made my hasty retreat to the bathroom. After vomiting for over 8 hours into Sunday morning and a fever of 102, I have finally crawled out of my bed and the bathroom. Many of you know that I had the opportunity to help decorate the Stegmaier mansion for Christmas..... the thrill of my life! LOOK at this creation of desserts!! Many of you know that I was a finalist in the local newspaper's Holiday House Contest. I actually never knew I was until the 21st which was the very last day because I never clicked onto the site until then and when I saw my home with 188 votes from people who I did not know, I was amazed. To have received 188 votes before I could even get the word out that I was in the contest was incredible. It put me in second place. I am not going to discuss the mess that happened after that with the family member of the person who I was running neck and neck with when all of my votes from people I know started to vote for me which caused me to wash my hands of the whole thing and ask to be withdrawn. 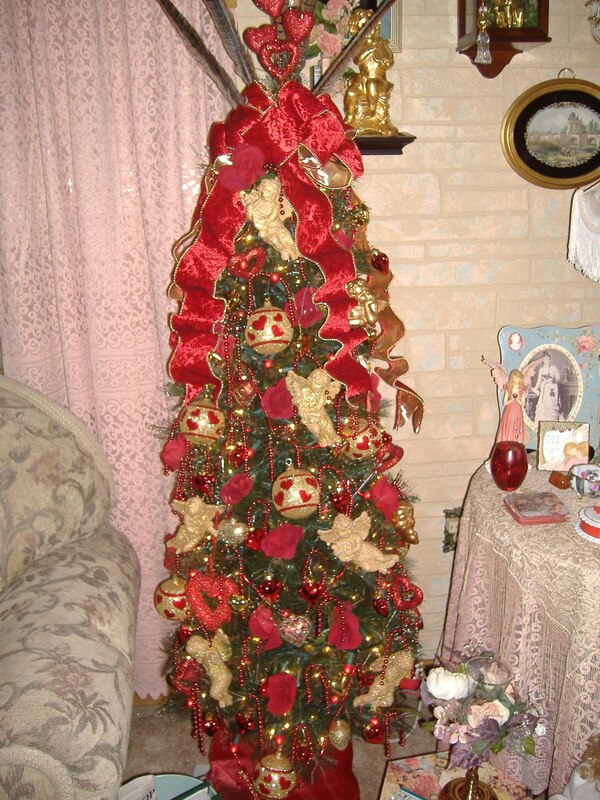 This was a silly little decorating contest and was not of any importance in the Scheme of Life. There are much more important things in life!! BUT I was contacted by the newspaper yesterday . They informed me that they were waiting to see if I won the contest because they had every intention of doing an article on me and my 14 trees whether I won or not. They were just waiting to see if I won and would incorporate it with the contest article to be run on Christmas Day which was supposed to feature ALL of the contestants. They approached me about consenting to a separate article because I told them that I did not want my name mentioned at all as part of the contest nor wanted my home featured in the contest article. I will consent to an article is if it is done separately from the contest and after Christmas. I do want to thank everyone who posted the link on numerous Facebook sites with thousand's of followers, on their blogs and emailed it out to everyone on their email lists. The newspaper said that they knew it would be posted on many Facebook sites and that is want they thought would be so cool about the contest! Beverly, our wonderful hostess for Pink Saturday, has asked us the question " What are you doing today, Christmas Day?" As I tell you about my day, I will be showing you more of my new treasures! First I will start with Christmas Eve. I am working Thursday night so when I come home from work on Friday morning, I am going to try to get as much sleep as I can. Being of Polish descent, I will be having Polish Holy Supper. Traditionally, it is the feast of 7 fishes but since I have a son who does not like fish, the menu needed to be modified. Prior to that, I will have gone to Mass. Joe will be working until 4:30 pm. New Pink Ornament that Joe bought for me at 75% off. Deals are out there already! We are sort of doing a Gift Free Christmas. Yep, you are reading this right. The boys and Danielle decided not to exchange gifts with each other and Joe and I told them not to buy anything for us as we truly do not need anything at this stage of our lives. We will be gifting the boys money as we have in years past. They are out on their own and need that more than anything. So the company of each other will be our gift to each other for Christmas. I will then go to work for 11 pm on Christmas Eve. Unfortunately, Hospitals do not close on Christmas! Great mercury glass ornament that Joe bought for me! I will remain at work until 7:30 am on Christmas Day morning. When I get home, I will be throwing the ham and stuffing in the oven to cook while I do the kielbasi ( Polish, remember?) on top of the stove. Look at these cute ornaments for 75% off! Now did I train Joe well or what??? I will then go to bed for about 3 hours. When I get up, I will put the turkey breast in the oven. Again, the boys and Danielle are coming for Christmas Day Dinner which will be served about 5 pm. Joe and I also have decided not to buy each other gifts for Christmas. When we need or want something , we just go and buy it so to buy each other something just for the sake of opening a present on Christmas Day is sort of silly at this stage of our lives! My greatest gift will be the time spent with my family! After the kids leave, Joe will pass out on the sofa ( turkey coma) then crawl up to bed usually about 9pm. I will have the house to myself so I will be catching up on visiting all of you, my blogging friends!! I will probably go to bed at my usual time when I do not have to work, 11 pm or 12 midnight. So there it is. Nothing spectacular, nothing exciting. You may ask why we do not visit relatives on Christmas Day? Out of the past 32 years, I have only been off 2 entire Christmas Holidays and that was for childbirth. When you work night shift , the policy is if you are off the Eve of the holiday then you work the Day and vice versa. It rotates every year. This is the same for every holiday of the year so you do not have to be at work twice on the same day ( if you work the Eve, you are there until 7:30 am and may have to come back in for 11 pm that night). It is more fair that way. so we stay home and have for several years now! I wish all of you and your family a Very Merry Christmas!! Well, Christmas is almost here and what a Holiday Season it has been! in addition to working full time night shift and participating in 2 Craft fairs and stocking my "Booth". Since I decorate as much as I do , I usually open our home to our many friends. Two weekends ago, we hosted 2 Open Houses, one on Sunday and one on Monday. Yep, back to back. It was easier for me that way because it was my weekend off. This Open House was for members of the Victorian Society that I belong to. What??? You don't see any?? That is because there are none to see!!! He talked, took no pictures. He got a bit confused on those instructions!!!! UGH!!!! Okay, he didn't have to take that one! I told you I was tired!! Like my silver Christmas socks????? LOL!! My punch bowl on a mirror. 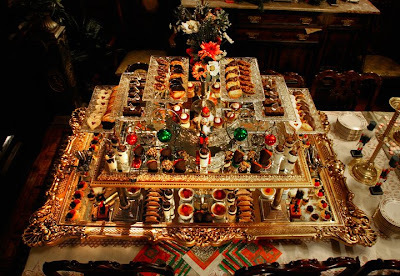 Idea borrowed from my friend, Joe Matteo , who owns the Stegmaier Mansion. I don't have the Baby Grand Piano though! This Open House was for every one at our Church that helps us with the Flea Market that we run , the Craft Fair that we also assist with and all the other things that we do for our parish. Mike, who is Peggy's husband. Mike is always there unloading trucks as we bring the Flea Market items from the garage where they are stored year round to our hall for each Flea Market. Peggy brought him because she wanted him to see our house to prove to him that her decorations really are not excessive!! LOL!! John and Lisa, who is giving Joe the look!! LOL!! Lisa and John, both soon to be published authors! Both are now in charge to managing events at the Stegmaier Mansion, the mansion's web site and the mansion's FaceBook site. Lisa will also be giving several presentations during Scranton, Pa. 's First Night Celebration! John's Book "Final Thoughts" will be out in stores in the Fall of 2011. He was recently featured on one of our local TV stations. 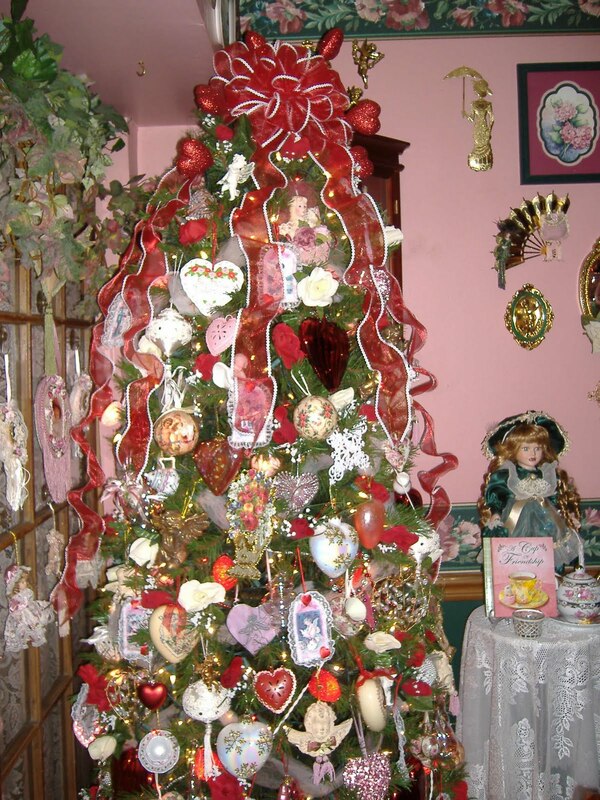 Lisa was responsible for making my dream come true.... to help decorate the Stegmaier Mansion for Christmas! Thanks Lisa, my dear friend!! Sorry that the pics are a bit blurry. Joe took them!! He didn't talk for this Open House! LOL!! This cute little angel ornament found a home on my Living Room Lamp Shade! Thanks so much, Ann Marie!! Maryann gave me this fantastic book on The Traditions Of Christmas! Now does she know me well or not!! I used illustrations from this book as part of a previous post. Please Click HERE if you missed it..
Christmas Spreaders, candy and soaps! So far, we have had close to 40 people come through our home for the Holiday season. These are the people who are most important in our lives and were glad to share it with them! ! We are truly Blessed! I just want to tell you that I stayed very tired as I laid down for 2 hours after this second Open House and then went to work all night!! I usually get about 5 hours of sleep a day....Crazy, I know! These cute pastry ornaments from J.C.Penney's! A Victorian stocking with red roses on it!!! And I just bought this adorable snowman!! Isn't he an elegant chap! Who could resist a snowman with a lace collar????? Well, this is my last post before Christmas!! Soon I will be going back over and posting regularly on my regular blog, Debbie-Dabble. I will continue to post All Things Christmas here through out the year. Thanks for a wonderful Holiday season in Blogland. I have learned so much from all of you but your friendship is my most cherished gift this Christmas! On a sad note, this Holiday season is not without tragedy. My next door neighbor was found dead the other day by her husband. She was 67 years old and worked everyday of her life, frequently at jobs that involved all hours of work. This has made me stop , again, and think about my own life. I did not want to mention it before but before Thanksgiving I , myself, have just received a tentative diagnosis of Lupus and Rheumatoid Arthritis. No surprise as I have been plagued with arthritis since my 30's and my sister has lupus. But I realize that my days of decorating like I do for Christmas are numbered so I think that is why I went all out this Christmas. To put things in perspective, there are worst things in life than Lupus and as a nurse, I am well aware of that. And look at my poor neighbor, We all could be gone tomorrow! Dance like no one is watching you!! Or in my case, Sleep like no one is taking photos of you!